A trackpad is not working after updating to macOS Mojave. Is the trackpad not clicking? Is trackpad not responding? Are you the one who are facing such unbearable situations with Mac or MacBook? Then you are at the right place; here you will get a solution to fix Mac Trackpad not working in Mojave. Apple Trackpad is very smart that works on finger gesture and touch sensitivity. Behind the Hardware sensors, there are many settings related to on your MacOS. Let’s Quick look where to check if you have a problem with your Trackpad. Such essential settings and work through useful for your iMac, and Mac mini has Magic Trackpad 2 Silver, MacBook Pro, MacBook Air that has a built-in TrackPad. There are many reasons behind this frozen trackpad of Mac. But you can fix it as I had set a few days before. Try the fixes below. Question: One of my Friend shared the story after I Reset/ Clean install I found the problem on trackpad gesture not working, Double click to open folder also not worked for me. 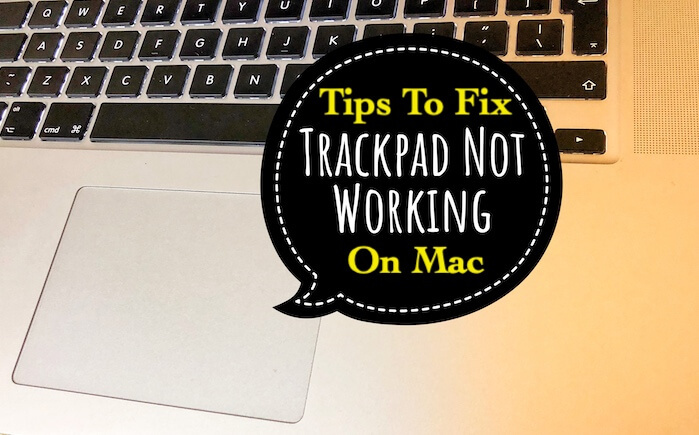 Firstly we will start with the comprehensive solution to fix the MacBook Air’s trackpad not working, or the trackpad is not working Mac Bluetooth (Remove Device from Bluetooth system preference and Reconnect it). This fix is a bit strange, but you must try to fix the trackpad of macOS Mojave. Step #1: From the “Apple” menu restart your Mac. Step #2: After successfully Mac restarts close the lid and leave it for 3 to 4 minutes. Step #3: Now open the lid and check if the trackpad is working or not. Disabling force click can be helpful when your Mac’s trackpad is not working. Kindly note that this fix will only work for the MacBook’s which have 3D touch. Step #1: Open “System Preferences” from the “Apple” menu. Step #2: Select the “Trackpad” and click on “Point & Click” tab. Step #3: Click on “Force Click” and “Haptic feedback” and uncheck it. credit goes to Spencer (). You may want to add another fix option to this article – open “accessibility option” by holding down the CMD, OPTION, and F5 keys at the same time. Ensure that all boxes are unchecked under “Mouse and keyboard”. one of these boxes got checked on my Mac during a software update and mouse froze on screen and many keys on the keyboard were unresponsive. Apple tech had no solutions to the problem! Resetting SMC is a universal solution for the hardware and power related issues on Mac. So we will reset SMC of MacBook with a non-removable battery. Step #1: Turn off MacBook. Step #2: Connect the adapter (MagSafe adapter). Step #3: Press and hold the Power button and Shift+Control+Option buttons simultaneously. First time Charging Adapter color will be Red in Shut down mode. Step #4: When you release the keys and find that MagSafe adapter changes color to green than SMC is successfully reset. Now, Press only power button to start your Mac. Step #5: Now restart Mac and check Mac trackpad is working on Mojave is fixed or not. Like we have seen how to reset SMC and why to reset SMC. Likewise, resetting PRAM has the same function as of SMC. So let’s fix Mac trackpad is not working on macOS Mojave by resetting PRAM. Step #1: Shut down MacBook. Step #2: Turn it on and immediately press Option+Command+P+R keys altogether. Step #3: Release the keys when you hear the second startup chime man’s Startup sound. It is necessary to keep your Mac updated with latest firmware software otherwise you will face such problems while using Mac. So it is better to update the Apps and system software periodically to use seamlessly. Open the Mac App Store and check for updates. Useful: Turn on Automatic Software Update on Mac. If none of the solutions works for you, then you should take the help of professionals and get your problem solved. Hardware issue may create a big problem like this. Find the real reasons from apple support center nearby you. Thanks. Now Mention your suggestions and helpful tips in the comment. Also Spread this guide in your social friends via the share on Facebook, Twitter or Google Plus. since the 2nd beta of Mojave, my internal keyboard and trackpad is not detected. I’ve sent the problem to apple but no changes. You may want to add another fix option to this article – open “accessiblity option” by holding down the CMD, OPTION, and F5 keys at the same time. Ensure that all boxes are unchecked under “Mouse and keyboard”. one of these boxes got checked on my Mac during a software update and mouse froze on screen and many keys on the keyboard were unresponsive. Apple tech had no solutions to the problem!